After being a seller on Etsy for a little over two years now, I sometimes feel like an old-timer there - a bit over the hill almost. Last year around this time, I remember being in a lot more treasuries, Storque blog articles, and other little features here and there. Now, with so many fiber art newbies and shops in general, sometimes I feel like it is easy to get lost in the crowd - especially if you have been around for a while and are no longer a "fresh" face to see. Don't get me wrong though! I love Etsy and its community there. Sometimes I love it a little too much! Browsing shops and the forum there really impedes on my daily activities if I let it. On most days, I feel like my shininess has worn off a bit though because I've been around the block on Etsy a few times. If one of my items does get featured somewhere on Etsy, it is a little boost and affirmation that perhaps I am still on the right track some how - whether fresh, new, and shiny or not. 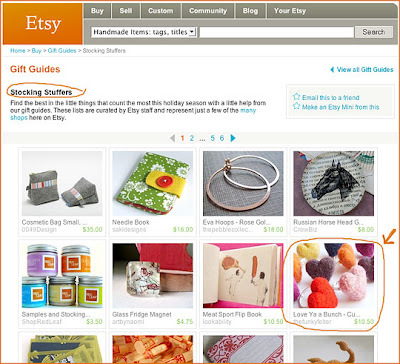 I felt that little boost yesterday when I ran across my handmade felted heart rings on the first page of Etsy's gift guide for stocking stuffers. It is so nice when the occasional, out-of-the-blue feature happens anywhere, and it is even better when you stumble upon it by accident. That little gift guide feature makes this old Etsy geezer very happy! I think that I am a little fresh and shiny today after all. *hugs* from one Etsy geezer to another :) Those rings are wonderful and I'm glad they/you are getting the recognition you deserve!